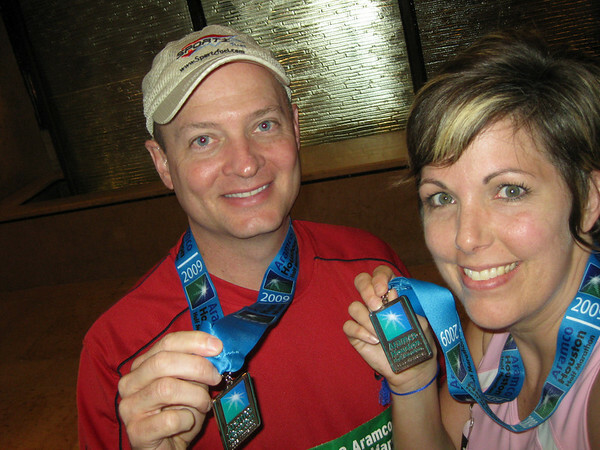 Scott and I commemorated our 13 years of marriage yesterday (our anniversary was in June) by running 13.1 miles. Except not really together, because he runs much faster than I do. And there were approximately 18,000 other people running around us. Well, go big or go home, right? I told him to run his own race and not to worry about staying near me. He could have started with the first wave, with the faster runners, but he kept saying he was going to stay with me. 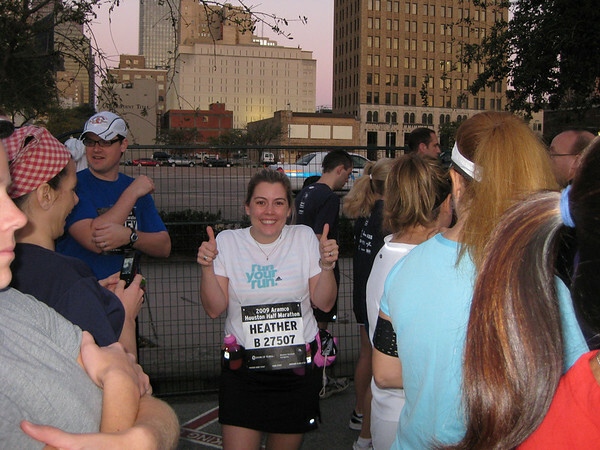 We waited at the start with my sweet friend Heather (Isn't she cute? Her hubs was running his first half too.) and a few other running buddies. Once we finally got going everything was moving pretty slow because of the mass of humanity crossing the start line and moving across 4 crowded lanes. Up an overpass of all things. Why didn't I do hill training? Why don't I EVER do hill training? 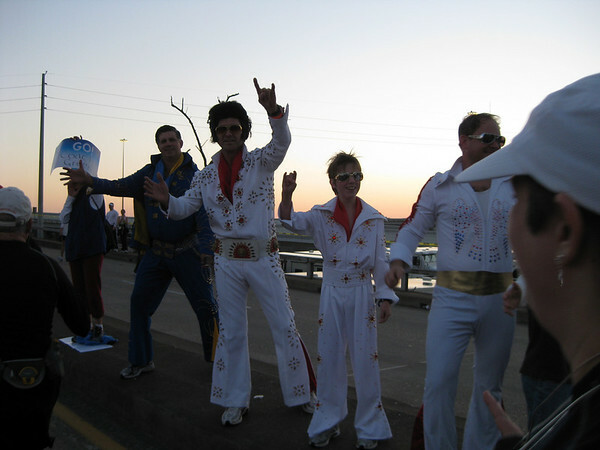 A group of Elvis impersonators (or maybe one of them was real?) greeted us on the overpass. Definitely picture worthy. Should I refer to them as Elvi since there were more than one? So we were not yet 2 miles into the thing and my beloved turned back to me, frustrated already at the crowds and the general slowness surrounding him, and said, "I'll see you at the Watermill Express." Yep. I so knew he was going to do that. That was our planned meeting point after the finish. So he was basically telling me, "See ya, slowpoke." That's okay though. After the crowds thinned out I caught up with Heather, Catherine and other running buds. 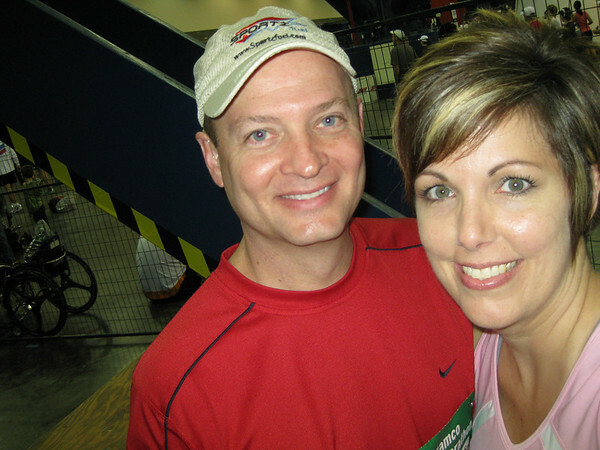 Heather and I managed to stay together for the rest of the race and that made it a LOT of fun. I hope I didn't hold her back, because her other buds were going a bit faster. Around mile 5 I had to document something else that gave me pause. Note to self: if ever tempted to run a race in gold lame leggings, please remember these brave, yet somewhat misguided feather bedecked ladies. From their blessed back sides no less. Yes, those are fish net tops covered by white sequined bras. Yes. At least they were in a group I suppose and didn't have to go gold all alone. The rest of the race was a pattern of 5-1 intervals, sometimes 4-2, cheering each mile as we reached it. There were tons of spectators, bands (even one-man), signs and applause. There is something so motivating to hear strangers call out your name (this year our bibs had our names printed much larger) and cheer you on. Scott had finished about 40 minutes before I did, so he was waiting for me inside the convention center. He felt pretty good considering this was his first half, he had struggled with IT band issues and his training was somewhat, um...spotty. Okay, Pot called and said the Kettle was looking pretty black too. Here we are proudly showing off our medals. And my sweaty hair. But look, my mascara survived! Even though we didn't run together, we ran the same course and covered the same distance. I'm so proud of Scott for crossing over the line from spectator to RUNNER. It's not a huge step, but it changes everything. He might just be hooked. I hope you are feeling better today. I feel good...just walking a little slow! Woah! Double take on the gold lame...oh dear! You made me laugh so hard in this post. Congratulations on the anniversary run with Scott! I am so glad yall did that together! Hee Hee...you always make me laugh with the wild things you see and hear...Oh, and get pictures of! wow- i'm still blinded from those gold leggings! oooh- so what NOT to wear to a race!!! and yes- my husband is notorious for saying he'll stick with me, and then he loses patience and runs ahead. congrats on another half down! you are the half and marathon queen!! not sure what to say about the gold lame. wow.... Yes, put on the eyes and be proud! Congratulations! You look great, even after running 13.1 miles! Love the medals! I looked for you on the news, but didn't see you. I did see the GOLD LADIES though. So they aren't a local myth, eh? The day (or two) after: Scott's legs are feeling pretty good, considering this was his longest run. He has been faithfully foam rolling which is helping his IT band and hips. I'm trying to nudge him to set his next goal. We'll see. My right foot is sore and I'm walking all wonky. I'm trying not to be a hypochondriac, but what does a stress fracture feel like? I'm hoping it's just tendon soreness! Thanks everyone for your encouragement and well wishes! What a great way to celebrate your anniversary! love it! and congrats! And those gold gals - what were they thinking?!?! Do tell the name of the mascara! You guys did great, congratulations! Yes, those crowds yelling your name and telling you how great you are is a lot of fun. (I ran, too.)Congratulations! Running 13.1 miles is a huge accomplishment! Congrats to you both!! One of those specatators with me. Caught you at the finish gave you cowbell and screamed Holly. You kinda looked at me like huh, who..LOL!